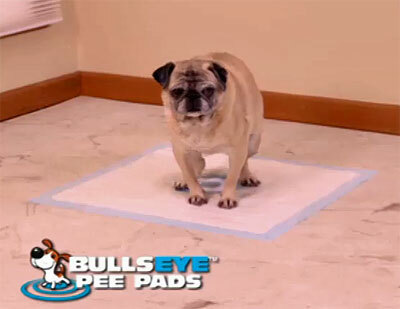 “Does your dog think your rug is his pee pad?” is the thought-provoking question posed by the Bullseye Pee Pad infomercial. The infomercial tells us that this product has “concentrated pheromones right in the center of the pad only” so that your dog “hits the target every time guaranteed.” What this commercial fails to tell its viewers is that those pheromones are the same ones that entice your dog to sniff the butts of other canines. If only they had mentioned this pertinent fact, the ad for Bullseye Pee Pads would have gone down as one of the great television infomercials of all time. They said it’s good to use for bad weather and when you live in an apartment, but what happens when your dog has to poop? They act like dogs only pee in that commercial. The pheromones in the pad would most likely cause my dog to chew on it. I don’t need my dog to create a mess. If the dog from the apartment seriously has to go out and “do his business” why is the elevator going UP? Only TV I suppose…. These work great for my dog. She will run from the length of the house to get on her pee pad. I am very pleased with them and highly recommend them! THIS WAS AN ABSOLUTE WASTE OF MONEY!! I have one dog that uses pads and she peed on the edges and all over the floor because the pads didn’t absorb any of it!! Then I put one of the pads on to of the other v brand I use and she peed on them but no where near this “amazing” bull’s-eye pad!!!! I went to the site but there is no place for reviews… AWHAT A RIPOFF! !